Notes Unbeknownst to Cantor Leibele Waldman, in 1967, two years before his death, a non-Jew was hired to record the entire High Holy Days Service (S’lichot, Rosh Hashanah, Yom Kippur). Several selections of these live recordings are now being made public for the first time. 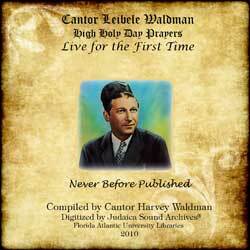 The twelve tracks on this CD were personally selected from the original tapes by Cantor Leibele Waldman’s son, Cantor Harvey Waldman. The tapes were digitized at the Judaica Sound Archives by Ben Roth-Aroni. Cantor Harvey Waldman writes, “The selections chosen will give you a good idea of how my father (z”l) sounded in person. Two orthodox authorities gave permission for these selections to be heard publicly which were the wishes of the Waldman family. Please be aware that the over load of sound, at times, caused some diminution since it was not recorded in a sound studio and that the choir was not one that he worked with on a regular basis.